Great meatballs deserve to shine in a sandwich like this—with green peppers, onions and BBQ sauce on a crusty Italian bread roll. Prepare Mastering the Meatballs recipe; cover to keep warm. Heat oil in large skillet on medium-high heat. Add peppers and onions; cook and stir 5 minutes or until vegetables are crisp-tender. Add meatballs and barbecue sauce; mix lightly. Cook 15 minutes or until heated through, stirring occasionally. Spoon 4 of the meatballs into each roll. Top sandwiches evenly with the vegetable mixture and cheese. Place on rack of broiler pan. Broil 2 to 3 minutes or until cheese is melted. This hearty sandwich is an easy entree to pull together when you're running short on time. Add Italian flare to the sandwich by substituting pasta sauce for the barbecue sauce and KRAFT Shredded Mozzarella Cheese for the Cheddar cheese. 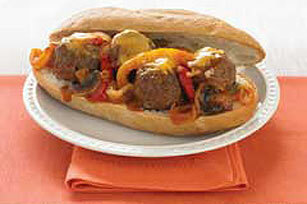 For quicker preparation of the sandwich, keep the meatballs on hand in the freezer. Thaw overnight in refrigerator before using.